More great lesson ideas and articles in our Language & Literature Subject Center! Common Core Standard: CCSS.ELA-LITERACY.RI.4.1- Refer to details and examples in a text when explaining what the text says explicitly and when drawing inferences from the text. Common Core Standard: CCSS.ELA-LITERACY.RI.4.2- Determine the main idea of a text and explain how it is supported by key details; summarize the text. Common Core Standard: CCSS.ELA-LITERACY.RF.4.4.B- Read grade-level prose and poetry orally with accuracy, appropriate rate, and expression on successive readings..
Common Core Standard: CCSS.ELA-LITERACY.RL.3.6- Distinguish their own point of view from that of the narrator or those of the characters. Common Core Standard: CCSS.ELA-LITERACY.RF.4.4.A- Read grade-level text with purpose and understanding. Common Core Standard: CCSS.ELA-LITERACY.RL.3.5 Refer to parts of stories, dramas, and poems when writing or speaking about a text, using terms such as chapter, scene, and stanza; describe how each successive part builds on earlier sections. Common Core Standard: CCSS.ELA-LITERACY.RL.3.3- Describe characters in a story (e.g., their traits, motivations, or feelings) and explain how their actions contribute to the sequence of events. Common Core Standard: CCSS.ELA-LITERACY.RL.3.1- Ask and answer questions to demonstrate understanding of a text, referring explicitly to the text as the basis for the answers. Common Core Standard: CCSS.ELA-LITERACY.RL.3.2- Recount stories, including fables, folktales, and myths from diverse cultures; determine the central message, lesson, or moral and explain how it is conveyed through key details in the text. Common Core Standard: CCSS.ELA-LITERACY.RF.3.3.D- Read grade-appropriate irregularly spelled words. Common Core Standard: CCSS.ELA-LITERACY.RF.3.3.C- Decode multisyllable words. Common Core Standard: CCSS.ELA-LITERACY.RF.3.3.B- Decode words with common Latin suffixes. Common Core Standard: CCSS.ELA-LITERACY.RI.3.9- Compare and contrast the most important points and key details presented in two texts on the same topic..
Common Core Standard: CCSS.ELA-Literacy.RI.3.1: Ask and answer questions to demonstrate understanding of a text, referring explicitly to the text as the basis for the answers. Common Core Standard: CCSS.ELA-LITERACY.RI.3.4- Determine the meaning of general academic and domain-specific words and phrases in a text relevant to a grade 3 topic or subject area. Expand students’ cultural horizons by shaping a fun dialogue-writing exercise around Guy Fawkes Night, a November 5 historical observance that’s popular in England. Students draw inspiration from J.K. Rowling's Harry Potter, Mary Shelley's Frankenstein and Lewis Carroll's Alice in Wonderland in order to jump-start their own creative writing process. In this lesson, which encourages students to think about the sounds of poems, students use lip-syncing software to produce an animated talking head. In this lesson, K-5 students select a pet and a travel destination, then find four things the pet could do at that locale. Designed for use with Inspiration/Kidspiration, the lesson can be adapted for use with other programs. Want to improve your students' quality and quantity of writing? Check out this lesson plan for grades 3-5! Students assume the persona of a real or imagined classroom pet and write a blog describing daily activities in the classroom. In this interdisciplinary lesson, K-8 students try to interpret what pictographs -- pictures that symbolize a word or concept -- really mean. Then they write sentences using their own pictograph system. In this activity for grades 3-8, students define 4-5 vocabulary words, use a free online tool to create crossword puzzles with the words, and then share their puzzles for review. Are your students learning their ABCs? Then check out these easy-to-use and fun Web sites filled with ideas for teaching and learning the alphabet. Whether you make the sites available in a computer center or display them on a projector, something valuable is just a click away! Students in middle and high school learn to use Word's Find/Replace feature to check written work, increase accuracy, and improve their grades. Teachers might want to use the feature too. Students love seeing their work in print, so why not have them write some of their work on the computer? Walk students through the basics of typing and saving on a computer. Still grading essays, red ink pen in hand? Next time your students have an essay due, ask them to submit their work in Word, help them identify their grammar and spelling errors, and then have them correct those errors using Word's table feature. In this Letters About Literature lesson, students read and discuss letters written by young readers to the authors of books that "gave them wings." Students explore a variety of poems, find one poem they feel a particular connection to, and share that poem by reading it aloud to their classmates. Students then create videos of their readings to share with other classes. Make writing across content areas fun with this K-3 computer activity. Students use AppleWorks (or Office) to write and illustrate number stories. The stories then are used to create a Keynote or PowerPoint show and displayed for the class (or parents!) to see and share. Transform students from passive readers to gritty journalists. In this lesson, students read a short story, then create a one-page newspaper depicting the facts of the fictional story as real-life events. Included: Links to an online newspaper template as well as to a classic short story site are included. Engage students while practicing translation skills. This activity helps foreign language students decode newspaper articles from around the world using Microsoft Word's Text-to-Table tool. Puzzles exercise students' critical thinking skills while providing practice in many curriculum areas. Puzzles make great "bellringer" activities. Introduce a puzzle a day: A puzzle a day provides practice that pays Included: A year of puzzles! Learning grammar has been compared to other fun things -- like having teeth pulled or being assigned detention. But it needn't be a painful experience with these five lessons that teach grammar -- without the hammer! A classroom word wall has many uses. A wide variety of activities and games can be used to reinforce vocabulary words on the wall -- and to build students' vocabulary, spelling, and writing skills. Included: Teachers share favorite word wall activities. Celebrate Books: A (Book) Week of Fun! The calendar might identify November 17-23 as Children's Book Week, but for most teachers -- always on the lookout for new ideas to promote literacy -- every week is Book Week. 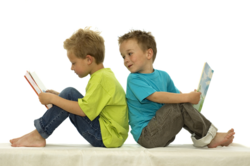 Education World offers five new lessons for a week of reading fun. Debates are a staple of middle and high school social studies classes. But have you ever thought about using debates at the lower grades -- or in math class? Education World offers five debate strategies and extra lessons for students of all ages. Tired of the same old book report formats? This week, Education World presents a sequel to its popular "Better Book Reports -- 25 Ideas! article. Are you ready for 25 more practical book report ideas? Are you looking for ways to spice up boring old spelling routines? This week, Education World offers five activities to help you do just that! Is letter writing a lost art? This week Education World provides five new lessons to revive student interest in writing friendly letters. These letter-writing lessons are sure to get your stamp of approval! Activities to teach fables, fairy tales, folktales, myths, and more. In celebration of National Poetry Month, Education World offers more than 20 poetry lesson plans to help teachers integrate poetry into their classrooms and develop "well-versed" students. Stage a poetry slam for profit, find the funniest poems around, write synonym poems, more! Engage students with writing activities that involve them in writing round-robin stories, "indescribably" excellent descriptions, persuasive alien essays, tabloid news stories, and books about younger students they interview. According to the NAEP Writing Report Card published in 1999, 23 percent of fourth graders, 27 percent of eighth graders, and 22 percent of high school seniors, write at the "proficient" level. The push is on in schools across the U.S. to improve students' writing skills. This week, Education World provides five lesson plans to support that effort. Better Book Reports -- 25 Ideas! Tired of the same old book report formats? Do your students grumble every time you mention the words book reports? Spice up those old book reports with some new ideas. Education World presents 25 ideas for you to use or adapt. Instructor Marcia Goudie says, "The Internet has put literature into the teachers' hands." Her Web site -- Children's Literature Activities for the Classroom -- directs educators in the direction of lessons made to fit the literary works they teach. Who can dispute the value of a good story? Though students may initially view them as dull, biographies are the stuff that great classroom activities are made of -- history, honest, and heroism. With the help of the Internet, every teacher can bring biographies into the classroom! Vocabulary and Spelling: Do Your Students Say Boring? It is hard to argue the fact that a good vocabulary is an asset in life. What greater service can teachers perform than to help students foster their understanding of words? The Internet offers many tools for young etymologists and an abundance of great ideas for teaching vocabulary and spelling. Dig for definitions and pry for pronunciations -- virtual vocabulary has no limits! Spelling lessons and activities from Education World can help your students join in the fun of the 74th annual National Spelling Bee. It takes place next week in Washington, D.C. Author! Author! Activities for National Children's Book Week! Celebrate the joy of reading during National Children's Book Week! To recognize this special observance, Education World offers ten lessons to spark students' curiosity about the wonderful world of books! Included: Activities that engage students in writing sequels to a classic story, "interviewing" people in biographies, completing surveys about their reading interests, participating in a poetry slam, and much more! Read All About It! Ten Terrific Newspaper Lessons! Education World celebrates National Newspaper Week with ten lessons to help you integrate the newspaper into your classroom curriculum. Included: Activities that involve students in interviewing a local newspaper reporter, creating editorial cartoons, comparing newspapers, and much more! Who can dispute the value of a good story? Though students may initially view them as dull, biographies are the stuff that great classroom activities are made of -- history, honesty, and heroism. With the help of the Internet, every teacher can bring biographies into their classrooms! Included: Ten activities that begin with biographies! Are you looking for a fun and effective way of promoting the spirit of cooperation in your K through 3 classrooms? This week ---National Library Week--- Elaine Lindy, creator of the Absolutely Whootie Web site, shares three favorite folktales that will get kids thinking and talking about the importance of cooperation! After you use the tales in the classroom, why not send them home so the discussion about cooperation can continue? Included: Lindy shares follow-up activities and tips. I think that I shall never see ... well-disciplined creativity! How often has that thought crossed your mind? Don't despair! The experts -- working poets who teach their craft--- share their secrets for instructing and inspiring budding poets. Included: Exercises to help students access their creative powers and produce well-crafted poems. Many teachers have discovered the power of famous quotations. Such quotations can be used to develop students' writing and critical thinking skills. Included: "Why use quotations?" *plus* a quotation a day for 180 days of school. Priceless Works of Language Arts: Invaluable Activities! There are many ways to enrich the language arts lessons you teach. One is to add gems from the Internet to your collection. Teachers everywhere share their priceless bits of wisdom through mailing lists and publish their best ideas on Web sites. Let's mine the Web for golden reading, grammar, and language activities! Kids Can W.R.I.T.E. (Write, Revise, Inform, Think, and Edit) --- Activities for Every Grade! In July of 1965, Snoopy's first line as an author was, "It was a dark and stormy night." We can't all have his wonderful way with words -- written at least -- but we can work on it! How do you help your students overcome their fear of the blank page? How can you make writing an exercise in personal expression, not drudgery? One key to better writing is better writing assignments -- and the Internet has them! Let's tour a few of the finest writing activities that the Web has to offer! Henry Ward Beecher said, "All words are pegs to hang ideas on." If words are pegs, does it follow that the more words we know, the more ideas we may have? True or not, it is hard to argue the fact that a good vocabulary is an asset in life. What greater service can teachers perform than to help students foster their understanding of words? The Internet offers many tools for young etymologists and an abundance of great ideas for teaching vocabulary and spelling. Dig for definitions and pry for pronunciations --- virtual vocabulary has no limits! Build vocabulary skills, spelling skills, literature awareness, thinking skills, and more with daily fun. Make it a goal to work one of these Web sites into your lesson plans in the year ahead! "If I feel physically as if the top of my head were taken off, I know that is poetry," said Emily Dickinson. Many students wouldn't disagree! Even the best teachers and students can be perplexed by poetry, but it doesn't have to be a painful experience. The Web is a rich source of verse and activities that make use of poetry. Bring poetry into your classroom through monitor and modem with the help of these activities! Tired of the same old book report formats? Or worse, do your students grumble every time you mention "book reports"? Spice up those old book reports with some new ideas. Education World presents 25 ideas for you to use or adapt. In addition: Ideas for cyber book reports! Teachers are the original "borrowers." But there's nothing wrong with taking advantage of a good idea -- especially when it is volunteered! National Children's Book Week (November 16 to 22, 1999) provides the perfect opportunity to take advantage of a few of the Internet's best resources for teaching with children's books. So, books closed, pencils away, and monitors on -- it's time for some S.S.R. (Super Story Resources)! Included: Resources for teaching literature for teachers PreK to grade 12! Looking for some inspiration for an activity that will engage students -- from kindergarten to college -- while they learn? Why not challenge students to create their own ABC books? Included: More than 200 ABC book ideas -- spanning the grades and the curriculum! Teachers who've joined The Read In! share their favorite reading activity ideas. Included: Theme ideas for reading fun! To celebrate Children's Book Week, the folks at the BOOK-IT! Program have given permission for Education World to reprint 25 great ideas from teachers -- ideas that are sure to get kids across the grades excited about reading! Glori Chaika's students at Slidell (Louisiana) Junior High School are among the most-often published poets in the country. Let's take a look at a program that has kids writing all kinds of poems---from quatrains to limericks to (yes!) Italian sonnets.